Their better albums, for me, are the ones that lean more towards melody than "bunch of notes." the animation in the new video for Paralyzed reminds me a ton of the intro/credits for HBO's WESTWORLD. the song is okay, not as good as Fall Into the Light, but I need to listen to it more. It's interesting... the meat of the song itself is still DT trying to be nu-metal, but again the middle section is slow and melodic and interesting. They really are trying to break their usual songwriting patterns with this album, and I appreciate it. 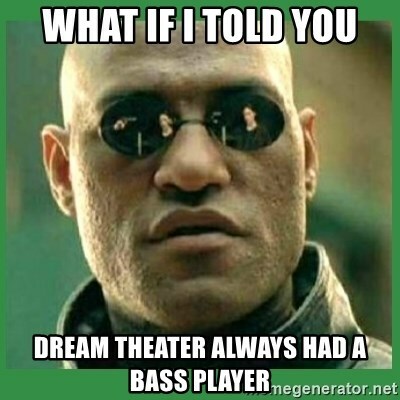 Dream Theater has bass player? In their best albums, they have the perfect balance between melody and technique. I'm not a big fan of DT trying to be too melodic and commercial, as they did in "falling into infinity". In Metropolis Pt2, they had much more success in their formula. That's the thing, though. They can't hide their technique. It's just how they write and play. FII and SFaM are two of my favorites, and I don't see much on FII that would have been played on the radio. I don't see much on FII that would have been played on the radio. "Burning My Soul" got radio play when it was new. Big fan of Six Degrees and Dramatic Turn of Events. I have huge doubts about the new one. I might not even listen to it. i like three tracks Room 137, S2N, and At Wit's End...the rest...completely SHELVED. Mine is on its way to me, from what I've heard I'm hoping for the best. Its amazing how DT fans can listen to the same album and come out with wildly differing opinions as if they were listening to completely different music. What? They put THREE ballads on the album in an effort to placate the label. They got "Youuuuuuuu Not Meeeeeeeeeee"
Yup, just like in 1961-91 it's still the bad fatties in suits munching their cigars up against the mighty tophat who rule the game, having figured how a balladeering DT will appeal way more than the uncompromizingly tough, metallic one. Mind you, 'Anna Lee' is one of my favourite Dream Theater songs, so go figure... I'd much rather listen to Falling Into Infinity than quite a few of their other albums. After the epic rubbishness of The Astonishing, I'm cautiously optimistic that this new one might be a return to form - but I've not really enjoyed them wholeheartedly since Portnoy left, despite trying my best. Indeed, I haven't really liked any album since Octavarium (and the Score live album). My first impressions on Distance Over Time are disappointing. I'm not going to be demanding and compare it with the classics, but it doesn't even come close with their previous efforts. Dream Theater (2013) had memorable moments, a combination of catchy prog songs, a ballad and an epic. With The Astonishing at least they tried something different, it has its moments even though the duration of the album is too long. In Distance Over time nothing stands out, i can't find many memorable moments. Petrucci and the production totally overshadows everyone and everything. I think it's time they did some radical changes. Maybe get Portnoy back and a new producer to keep the balance between the musicians and give them some new vibes..
For me, it's by far the best of the four post-Portnoy albums, and perhaps better than the last one with him as well. I find memorable melodies all throughout, and I often have that middle section of Fall Into The Light running through my head. Different tastes I suppose! That happens very often with DT's music! I can't stand FII, other people consider it the best. Encouraging... really looking forward to a full listen... and I think that middle section of Fall into the Light is great. And they were all top 10 singles, right?